the fourth century BC or earlier. The official science has been saying all along that the ice-cap which covers the Antarctic is million years old. The question is: Who mapped the Queen Maud Land of Antarctic 6000 years ago? Which unknown civilization had the technology or the need to do that? It is well-known that the first civilization, according to the traditional history, developed in the mid-east around year 3000 BC, soon to be followed within a millennium by the Indus valley and the Chinese ones. So, accordingly, none of the known civilizations could have done such a job. Who was here 4000 years BC, being able to do things that NOW are possible with the modern technologies? All through the Middle Ages were circulating a number of sailing charts called "portolani", which were accurate maps of the most common sailing routes, showing coastlines, harbors, straits, bays, etc. Most of those portolani focused on the Mediterranean and the Aegean seas, and other known routes, just as the sailing book which Piri Reis himself had written. But a few reported of still unknown lands, and were circulating among few sailors who seemingly kept their knowledge about those special maps as hidden as they could. Columbus is supposed to have been one of those who knew these special sailing charts. To draw his map, Piri Reis used several different sources, collected here and there along his journeys. He himself has written notes on the map that give us a picture of the work he had been doing on the map. He says he had been not responsible for the original surveying and cartography. His role was merely that of a compiler who used a large number of source-maps. He says then that some of the source-maps had been drawn by contemporary sailors, while others were instead charts of great antiquity, dating back up to the 4th century BC or earlier. It appears that accurate information has been passed down from people to people. It appears that the charts must have originated with a people unknown and they were passed on, perhaps by the Minoans and the Phoenicians, who were, for a thousand years and more, the greatest sailors of the ancient world. We have evidence that they were collected and studied in the great library of Alexandria (Egypt) and the compilations of them were made by the geographers who worked there. 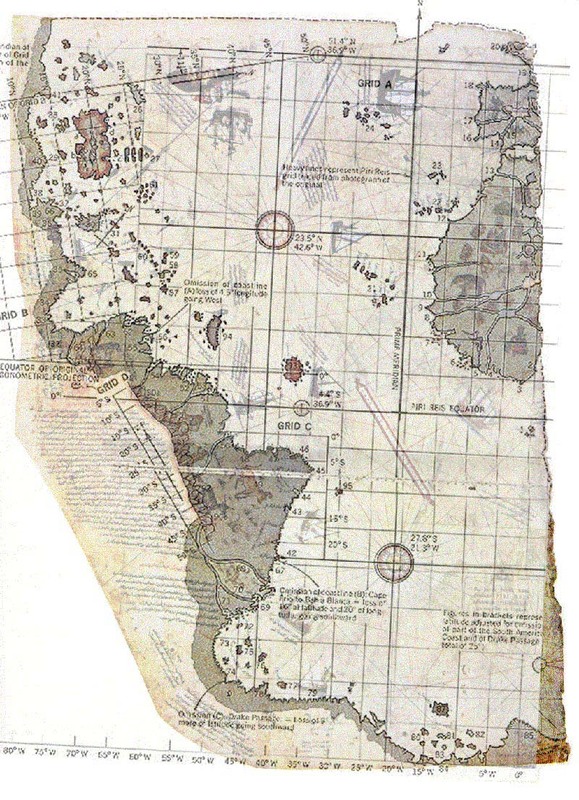 In 1953, a Turkish naval officer sent the Piri Reis map to the U.S. Navy Hydrographic Bureau. To evaluate it, M.I. Walters, the Chief Engineer of the Bureau, called for help Arlington H. Mallery, an authority on ancient maps, who had previously worked with him. Charles Hapggod, in 1953, wrote a book called "Earth's shifting crust: a key to some basic problems of earth science", where he made up a theory to explain how Antarctic had been ice-free until year 4000 BC (see Bibliography ). The reason Antarctic was ice-free, and therefore much warmer, it is to be found in the fact that, at one time, its location wasn't the south pole. It was located approximately 2000 miles further north. Hapgood says this "would have put it outside the Antarctic Circle in a temperate or cold temperate climate". Read more information about Pole Shifting. The reason why the continent moved down to its present location has to be found in a mechanism called "earth-crust-displacement". This mechanism, not to be confused with the plate-tectonics or the continental drift, is one whereby the lithosphere, the whole outer crust of the earth "may be displaced at times, moving over the soft inner body, much as the skin of an orange, if it were loose, might shift over the inner part of the orange all in one piece". (Charles Hapgood, "Maps of the ancient sea-kings", cited, visit the Bibliography for more info). Anyway, whether Hapgood's theory is correct, the mystery still thrills. The Piri Reis map is something which is not supposed to exist. I mean that by no means there was supposed to be anyone that far back in time able to draw a map of such precision; in fact the relative longitudinal coordinates are totally accurate, as stated by Official studies on the map that we saw above. And this is a demonstration of impossible technology: the first instrument to calculate the longitude in a approximately correct way has been invented in 1761 by the english John Harrison. An even more amazing chart is the "Zeno's chart", year 1380. It shows a big area in the north, going up till the Greenland; Its precision is flabbergasting. "It's impossible" says Hapgood "that someone in the fourteenth century could have found the exact latitudes of these places, not to mention the precision of the longitudes..."
As we saw, many charts in the ancient times pictured, we might say, all the earth geography. They seem to be pieces of a very ancient world wide map, drawn by unknown people who were able to use technology that we consider to be a conquer of the very modern times. Hapggod made a disclosure which amazingly lead further on this road: he found out a cartographic document copied by an older source carved on a rock column, China, year 1137. It showed the same high level of technology of the other western charts, the same grid method, the same use of spheroid trigonometry. It has so many common points with the western ones that it makes think more than reasonably, that there had to be a common source: could it be a lost civilization, maybe the same one which has been chased by thousands years so far? The Piri Re'is map is often exhibited in cases seeking to prove that civilization was once advanced and that, through some unknown event or events, we are only now gaining any understanding of this mysterious cultural decline. The earliest known civilization, the Sumerians in Mesopotamia, appear out of nowhere around 4,000 B.C. but have no nautical or maritime cultural heritage. They do, however, speak reverently of ancestral people who were like the "gods" and were known as the Nefilim. The map is thought to be one of the earliest "world maps" to show the Americas. Early scholars suggested that it showed accurate latitudes of the South American and African coastlines - only 21 years after the voyages of Columbus! (And remember, Columbus did NOT discover North America - only the Caribbean!) Writing in Piri Re'is own hand described how he had made the map from a collection of ancient maps, supplemented by charts that were drawn by Columbus himself. This suggests that these ancient maps were available to Columbus and could have been the basis of his expedition. As can be seen below, an azimuthal projection ( looking at the globe from a point above the globe), from the point above Cairo, Africa (Egypt) shows that the Piri Reis map corresponds more or less with the lower right quarter of this map if one rotates it some 20 degrees counter clockwise. Piri Re'is own commentary indicates that some of his source maps were from the time of Alexander the Great (332 B.C.). Apart from its great historic interest, the map has been alleged to contain details no European could have known in the 1500's, and therefore proves the existence of ancient technological civilizations, visits by extraterrestrials, or both. In response to people who ask how to explain why the Piri Reis Map shows the coastline of Antarctica accurately, the answer is - it doesn't. It especially doesn't show the subglacial coastline of Antarctica, which corresponds to the existing coastline of Antarctica around most of the continent anyway. 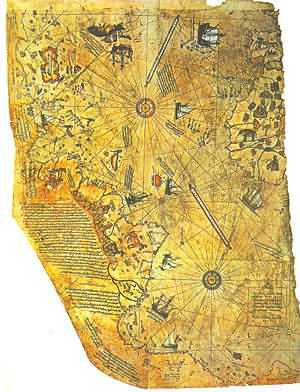 Strange Artifacts: Piri Reis Map, accurate map of the Antarctic region drawn 300 years before Antarctica was discovered. Also available more information about Charles Hapgod, ancient maps, and other unexplained maps.